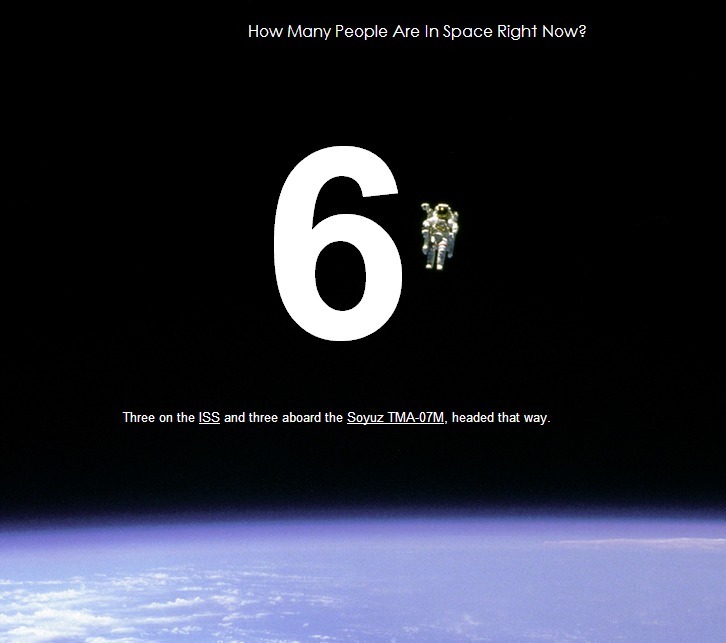 Kewl Site Alert: How Many People Are in Space Right Now? Today's gem comes courtesy of our fellow Canucks over at Boing Boing and is a particularly useful in random libation-heavy discussions in which you and your fellow bar-going nerds are debating the world's most important question: just how many people are in space at this very moment? No need to wrack your brains, just head on over to "How Many People Are In Space Right Now" (dot com) to get your answer in a lovely light mobile-friendly interface. Not only does it tell you how many there are, it also informs you as to their locations. Boing Boing's article points out that this information is in fact depressing, since the actual number is so low. But let's be a little bit optimistic and think about how kewl it is that there are currently 6 people orbiting around us. Or if you prefer, you could say that there are more out there that the government just hasn't told us about ;) Yay for conspiracy theories!